Just because we think we know everything doesn't mean we do. And even if we do there's going to be something new that we don't know and so we don't. As a graduate student at the University of Chicago I'd sometimes go through a spell where there were no classes for a day or two and I'd start thinking I was smart, I was something else, that the world was round and I knew where everything was located. Then the Monday afternoon seminar would come along. Some poor invited guy would come and give a presentation on what he was doing. Following that the faculty would proceed to make mincemeat out of him in a question and answer segment. Then I knew! I knew that I didn't. Eventually I started understanding why they were about to make hamburgers out of somebody, what theoretical heresy or logical gaff he was unravelling up at the podium. So I learned. But then my life changed and new things came that I needed to know. When you are by yourself you can start thinking all kinds of things, but in the face of life in the social setting, you'd better adjust to what IS! And cut the crap. 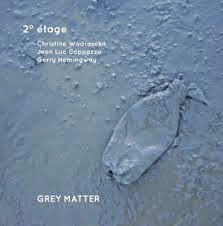 I am thinking such thoughts as I sit down to review the album by 2° étage, Grey Matter (No Business NBCD 63). Sure this is free, avant jazz. But that doesn't mean that somehow automatically you are gonna know what it's like. The group is a trio of Christine Wodrascka on piano, Jean Luc Cappozzo on trumpet and bugle, and Gerry Hemingway on drums/percussion. This is a live gig recorded in France in 2012. I came to this recording only familiar with Gerry Hemingway. And he comes through with a sensitive creativity that he is known for in the free zone. Jean Luc Cappozzo gets a rather formidable spectrum of sound colors from his horns and can blast off some really interesting phrases, too. Christine Wodrascka plays some smart things inside the piano. On the keys she is out and unpredictable in what she is going to do. And that surprise and spontaneity is good in itself--but her timing is almost speech-like, which makes her even more fascinating to hear. So in the end I couldn't say I knew everything that's been done before I heard this one--because this wasn't included and it isn't quite like anything else. So once again I know that you can't know what's next; once again I learn not to be cocky. This is a good one if you want something out-there that follows its own sense. And maybe shakes your sense of surety up just a little! That's good.